Hard To Find Plant Alert: Jerusalem Sage – Coming This Spring! It’s been a number of years since we’ve been able to offer Jerusalem Sage, Phlomis fruticosa. There was a wonderful specimen growing years ago that many folks saw as part of a local garden tour. I remember thinking then that all the garden shops in town could have sold many, many of them if we’d only known what a hit it would be! As it was, every other person that weekend asked us about it…and for many weeks after. 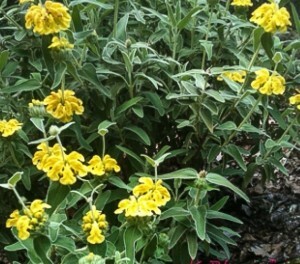 Jerusalem sage is one of those marvelous, on the edge of its comfort zone plants. Mine is at the very top of a rock outcrop where the drainage is excellent. Being a native of the Mediterranean, excellent drainage really is a must for this gray leaved, yellow flowering shrub. Provide part sun and adequate water through the summer, with infrequent, deep watering during the hottest, driest periods. Deer and rabbit resistance make it a good choice for any of you who have critter issues, too. So, do you have a spot for something new and interesting? Perhaps in a tough border area with mixed perennials and annuals…or maybe on its own in a planter in a protected spot. Wherever you choose to try it, you’ll be sure to get comments! This entry was posted in Flowers, Herbs, Perennials and tagged jerusalem sage, mediterranean plants, phlomis fruticosa on January 25, 2014 by Kris Blevons.